By Processing Your Payroll Today. Whether you are a small business or a large corporation, DirectPay has the Simple Solution to ease the burden from those time consuming payrolls. Our experienced staff will take processing your payroll very seriously to ensure the highest level of accuracy for you and your employees. Problems with turn over or just finding the right person for your Human Resource or Payroll Department? DirectPay makes it so easy, that experienced payroll personnel is no longer required. With DirectPay, our customers have access to an easy to use system, where they either enter in employee’s time directly or simply import time from an electronic time clock system. 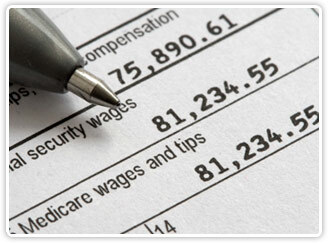 Once the time for that pay period is in our system, DirectPay will handle the rest. We will process your payroll by printing checks, processing direct deposit, print garnishments checks, calculate tax liabilities and even post them on-line for you, all for one low price per pay period. Plus there’s more… DirectPay handles your quarterly 941’s, annual 940’s and will print your W2’s for no extra charge, all of this at the same low price. DirectPay is offered in two platforms, an application version as well as a web based version. Please feel free to contact us to discuss details for which option works best for your organization.